Public apologies from Apple are rare, but not as infrequent as you'd think. The tech giant has been forced to say mea culpa for some pretty major snafus over the past decade. Maps: "We are extremely sorry"
Apple (AAPL) CEO Tim Cook on Friday apologized for the "frustration" its Maps app caused with a humble letter to customers -- so humble, in fact, that he recommended using competitors' products while Apple sorts out its maps mess. 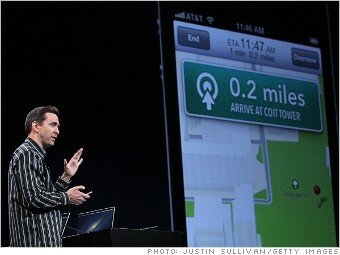 Cook preached patience with the new app, which replaced Google's (GOOG) maps data with Apple's own and other partners' mapping information. The CEO acknowledged, though, that the app failed to live up to users' high expectations for Apple products. NEXT: Location: "This is a bug"